Pelican Bar is one of those out of the way places to visit in Jamaica. You won't stumble upon it, you have to seek it out. You can only get there by boat, or if you're a long distance swimmer. It's a quaint little building of sticks and boards (no big bad wolves allowed!) 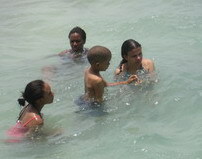 in the middle of the sea, off the coast of Parottee, St. Elizabeth. I spent a relaxing day there with friends and family. We left Black River, and ten minutes later loaded up in a fishing boat at Basil's Bar in Parottee and set off. Our destination was easily visible from the shore, and we were there in less than 10 minutes. It's on a sandbar, so the water is shallow enough for both adults and kids to stand in easily. We swam around for ages. It's good to have aqua shoes, as the sea floor is a bit sticky in places. And don't forget to bring your sunscreen - there are no shops in the middle of the sea if you forget this vital item! The bar itself isn't exactly a hub of excitement, but once you've got the company you want, it's all good. The food (fish or lobster) and drinks are pricey, but after you've been swimming around in the warm water for a few hours, you're more than willing to indulge yourself. The fish we had was freshly caught and tasty. The day we went we were witness to one of the most exciting animal chase scenes I've ever seen. Don't let your imagination get ahead of you, I'm not talking sharks or anything - it was only a frigate bird chasing a seagull, but it was something to see. Let's just say I'm glad I'm not a seagull, and I'm sorry Discovery Channel wasn't there to film it! We saw a few small stingrays as well. 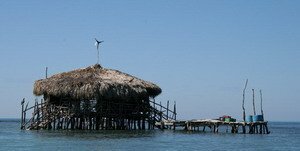 As places to visit in Jamaica go, I'd say Pelican Bar is a great place to relax, in an unforgettable setting. Blue blue water all around you, the town of Black River visible in the distance. It's best to let them know you're coming, especially when it's not tourist season (December to April). Call Basil's Bar at 369-2565. 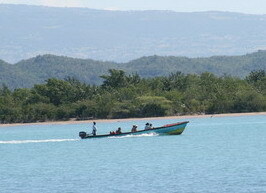 You can also get to Pelican Bar by boat from Treasure Beach(about half an hour). From Black River it's about 20 minutes - call Lando at 387-8008.